When I visit New Jersey a stop at Wawa (convenience store) is a must. TastyKakes are the main reason. True they can be found at Duane Reades throughout the city, but it’s fun to just have them on special occasions. 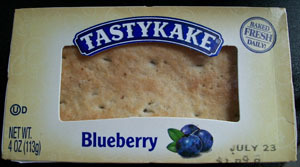 During the last visit I picked up the TastyKake Blueberry flavor (4oz/$1.69). The presentation is very appealing. The top has a perfect golden brown. 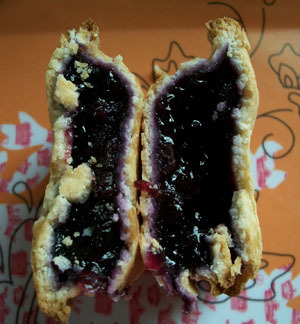 It breaks apart perfectly into halves. 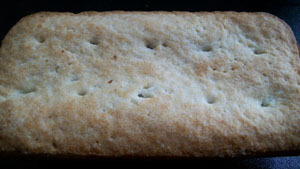 The cake is moist inside and they aren’t stingy about the filling. The blueberry flavor is pronounced though but so is the sugar. I found this a tiny bit too sweet without coffee to mitigate. I’d get this again with black coffee but would just as soon try out another flavor.